The cold weather will be here before you know it, and the last thing you want is to be stuck without heat when it does. If you have a very old furnace, or you’ve had a technician tell you that it’s close to its life expectancy, it’s probably a good idea to have your system checked out beforehand. While you may want to know how to check it out yourself before the winter hits, I strongly advise against anyone other than a licensed technician do this since you’re having to deal with natural gas. 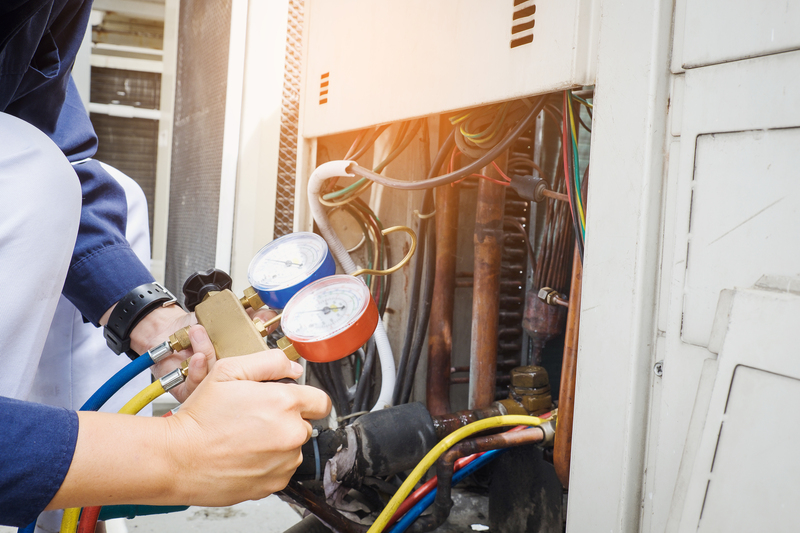 At Guin Service, when we come out for a pre-winter service call, we’ll check a few things in order to ensure your system is not only functioning efficiently, but also not putting you and your family in any danger. Our top priority is to ensure there are no leaks in the heat exchanger that could cause carbon monoxide issues. The heat exchanger is essentially the inner workings of the furnace where the flames are, and it’s designed to where those flames burn in a certain way. If those heat exchangers have any cracks in them, the flames don’t act properly, meaning gas and fumes can start to leak out. That’s where you get carbon monoxide issues. From a safety standpoint, we want to make sure the burners are working properly, and there’s no chance of carbon monoxide leaking out into the home. We’ll also check the vent to make sure the exhaust is not coming into your home. We’re not talking about the vent the air comes out into your home, but the vent the exhaust goes out. Think about your car. What if the exhaust pipe from your car was blowing all that inside the vehicle? Now that wouldn’t be good. We’ll make sure the vent is leading outside without any cracks or leaks. What can you do to have a more efficient system – and lower power bills this winter? A dirty system due to lack of maintenance is the number one cause of failure, on both the heating and cooling side. Of course, before it goes out, this will also cause your power bill to be much higher than it needs to be. Sitting there dirty for years and years causes the system to work harder than it was intended to, and that’s why it’s so important to change the filter. Think about if you had to run up a hill; you need all the air you can get. What if you had to run up a hill with a mask that only gave you half the air you needed? Your heart would have to work harder, your lungs would have to work harder, and you’d eventually break down. It’s the same concept here – when the unit can’t breathe, it breaks down. And remember, you can’t change the filter too much. Whatever filter you buy, you should follow the recommendation on the package, though, as a rule of thumb, if you’re using the inexpensive filters from a big box store, you’ll want to change it out monthly. I will say though, if you’re interested in indoor air quality, we do sell filters at Guin Service that you can change out every six months to a year, depending on the home. These are really popular because you know they’re working well, and you don’t have to change it until we’re there to do your regular maintenance. We just bring that filter with us so it’s one less thing you have to worry about. If you have an older heating system, the team at Guin Service gladly serves customers around Hoover, Mountain Brook and surrounding areas. Plus, if you sign up for GuinGuard, we’ll give you a call every six months to remind you that it’s time for maintenance. And no, this service doesn’t cost you a penny – does your dentist charge you when you don’t come get your teeth cleaned? Contact us today to make sure your heating system gets the attention it needs to run efficiently while lowering your bills this winter. Going on a trip? Get your home ready ASAP! © 2019 Guin Services LLC. All Rights Reserved.